Formally referencing the classic Eames Aluminium Chair from 1958, the VitraPhysix office chair by Alberto Meda combines the shape with 21st centurytechnology and materials. The one-piece, minimalist seat with flexible side bars made of polyamide and featuring an elastic fabric cover on a five foot die-cast aluminium base combines an elegant design language with the latest ergonomic standards. 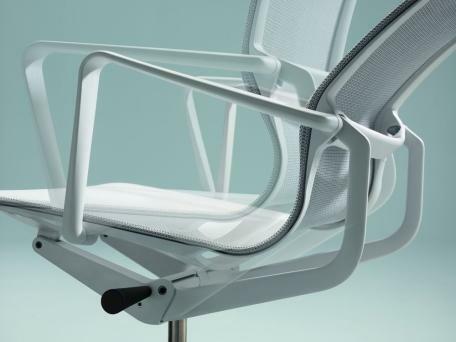 Physix is considered to be a modern version of the Aluminium Chair. Alberto Meda created a simply ideal working chair, combining state-of-the-art materials, excellent comfort as well as a whole bunch of options for individual setup. Care Plastic surfaces should only be cleaned with a soft, damp cloth and a mild, non-abrasive detergent. Dust and lint can be vacuumed. To treat blemishes, please use a damp cloth and a mild, non-abrasive, detergent. A professional cleaning should be performed in the assembled state and with the use of upholstery foam or using a mobile washing device. 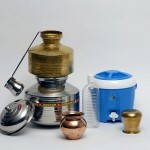 Product datasheet Please click on picture for detailed information (ca. 0,5 MB). The one-piece, ergonomically curved seat, the suspended cover and the closed arms of the Vitra Physix present a silhouette strongly reminiscent of the Vitra Eames Aluminium Chairs. On purpose. For his office swivel chair Alberto Meda took the chair icons and translated them with the help of advanced technology and modern materials into 21st century interpretations of the Vitra Classic. 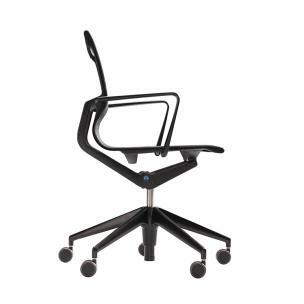 Released in 2012 the Vitra Physix is an office chair that in addition to its elegant form language meets current ergonomic standards. Central to the construction of the one-piece seat shell from Physix is the suspended textile seat; a construction wherein both the frame and the flexible elastic knit cover allow for Physix's ergonomic properties and sitting comfort. The organically shaped side rails are made of polyamide and follow the movement of the user, even when that movement is diagonal. Visually, the Physix is characterized by a lightness that manifests itself on the one hand in the permeable knitted fabric and on the other by the low material usage involved. Thus the Physix meets Vitra's high standards of both aesthetic and functional characteristics in context of office swivel chairs. Alberto Meda was born in Tremezzina, Italy, in 1945. Following the completion of his mechanical engineering studies in Milan Alberto Meda was employed from 1972 to 1979 as Technical Director at the Italian designer furniture producer Kartell, before establishing himself as a freelance designer. 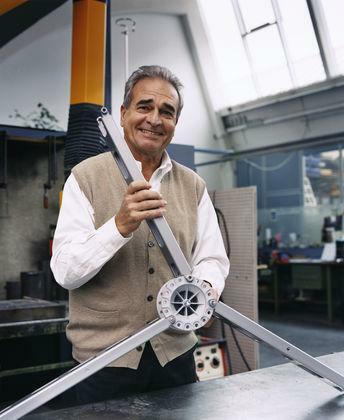 In addition to realising projects with companies as varied as Alias, Alessi, Philips or Olivetti, since 1994 Alberto Meda has collaboration with Vitra. The latest collaborationbetween Meda and Vitra is the office swivel chair Physix with which he pays tribute to the EA 117 in that he has created a contemporary version of the classic Eames. In addition to his furniture design work Alberto Meda has created furniture, lamps and technical objects, and also taught industrial technology at the Domus Academy in Milan and at the Milan Polytechnic. Since 2003 he has taught at the University IUAV in Venice and lectured at various other universities around the globe. The Vitra campaign for the Physix featuring members of from different professional groups. 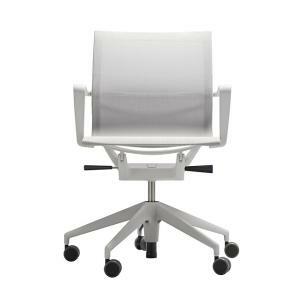 In 2012 Alberto Meda developed in collaboration with Vitra Physix: an office chair which personifies the latest standards. Although Vitra as a company are based in Birnsfelden, Switzerland, the majority of Vitra's production occurs in in Weil am Rhein, a small town in southern Germany, near the Swiss border. The Physix office chair combines TrioKnit - a multi-threaded, heavy-duty knit of polyester and spandex - with a frame made of flexible plastic polyamide. A five footed based made of powder coated die-cast aluminum forms the basis for the Vitra Physix. On the back of the chair are attached two aluminium brackets which transmit the movement of the side supports to spiral springs located in a housing beneath the seat. 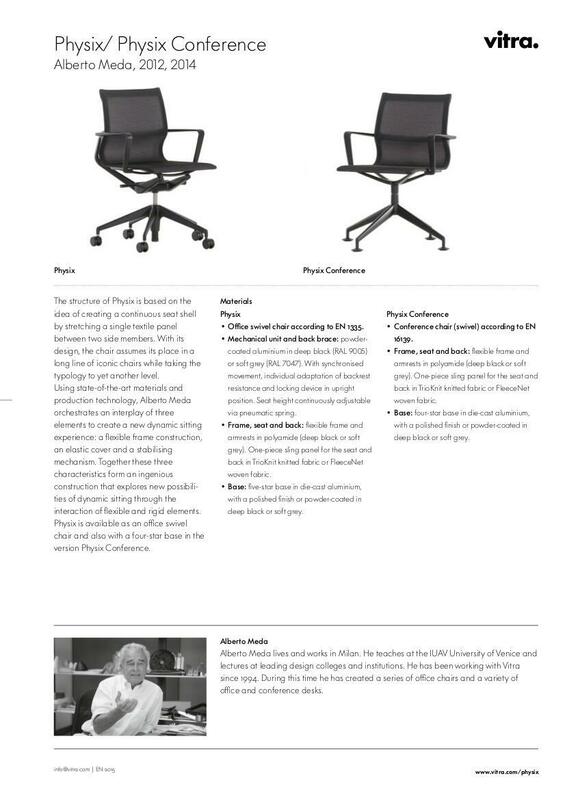 The integrated synchronous mechanism ensures the precisely controlled, biomechanical movement of the chair, movement which can be accurately controlled in every seating position and regulated dependent on the user's weight. Manufactured by Vitra, the Physix office chair by Alberto Meda is in good company. 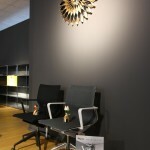 Since 1953, Vitra have produced contemporary designer furniture and have thus gained extensive knowledge in the field. And indeed one of Vitra's earliest chairs, the EA 117 aluminium chair by Charles and Ray Eames,is the formal godfather of Alberto Meda's Physix. In addition to the Eames designs Vitra produce and distribute furniture classics by designers such as Verner Panton, Isamu Noguchi and the Bouroullec brothers. Office furniture has part of the Vitra portfolio since the 1970s, the company's first office chair being the Vitramat by Wolfgang Deisig launched in 1976 at Orgatec Cologne. 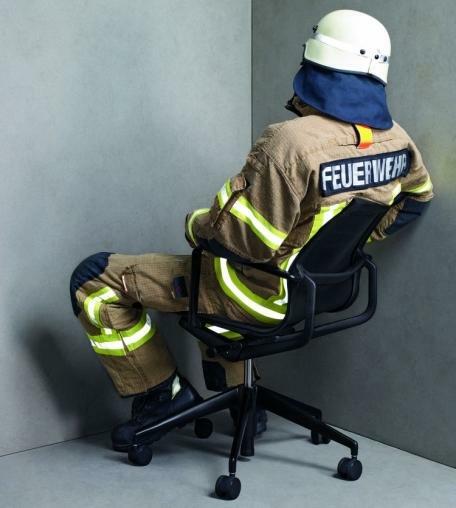 Although ergonomics was on everyone's lips even then, the design of office furniture hadbeen given little attention. 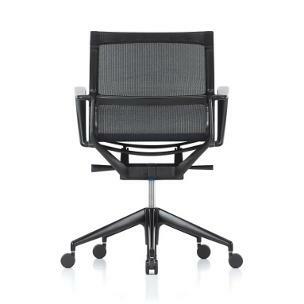 Vitra office chairs do things differently, placing as they do and did just as much emphasis on aesthetics as function.